Over the past two weeks I’ve been assigned to write not one, but two features on the Kentucky Derby for CNN.com. I knew exactly nothing about horse racing, so I had to get up to speed on the sport pretty quickly. Fortunately, I was able to secure an interview with Ahmed Zayat, an extremely affable gentleman who has three horses entered in the race, a feat that hasn’t been achieved in decades. Even more fortunately, he was Egyptian and happened to also be an alumnus of BU. So we struck up a friendly conversation off the bat and he very kindly granted me an extended interview and helped get me up to speed on the industry. The piece’s headline is “American Pharoah chases racing’s biggest crown” and can be read here. The next piece was a more ‘inside baseball’ look at horse racing. I’m linking the story to baseball on purpose, because the expression ‘hitting home runs’ was used so often by all the people I spoke to in the industry, that I could have been interviewing the New York Yankees. In horse racing terms, hitting a home run is investing in a horse that wins big races and becomes a champion stallion. His stud fees (what owners charge other breeders to have his baby horses) can go up to $100k per birth, up to 100 times a year for 20 years. I can hear the sounds of “Cha-Ching!” as I’m typing. That piece, entitled “Kentucky Derby: The Horses Swinging for Home Runs” can be read here. Between the two articles, I interviewed owners with stakes in 5 of the 20 horses competing in the field tomorrow. So I’ll definitely be tuning into the Kentucky Derby at 11pm UK time on Saturday. It should be a thrilling finish. Oh yeah, there’s also a boxing game going on tomorrow too… 4am UK time….. Let’s Get Ready to Rummmmmble! 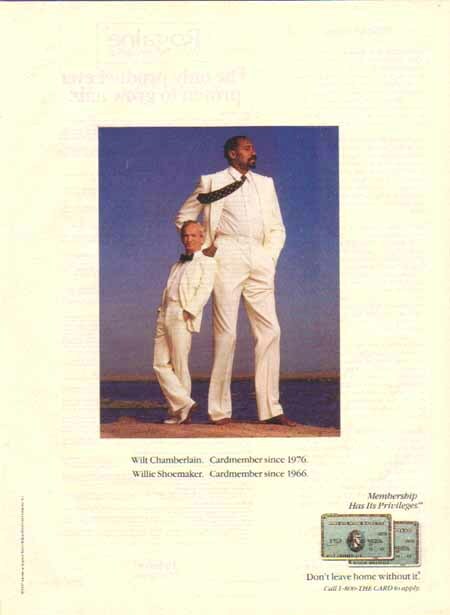 Two weeks ago, everything I knew about horse racing could be traced back to this American Express ad from the 1980s. RIP Wilt and Shoe.